It's Spring: The equinox, rain, warm temperatures and mushrooms. Shiitakes are pushing through the bark of the hardwood logs that are home to shiitake mushrooms at Lost Creek Mushroom Farm, where grow your own mushroom kits rule. With grocery store prices for shiitakes a whopping $8-22 a pound, a log kit can pay for itself in the second year, according to shiitake farmer Doug Williams. “It’s a lot of fun. And log-grown shiitakes are high quality, meaty, and more delicious than the store-bought shiitakes grown in sterilized sawdust.” Shiitakes contain compounds that create happy, joyful, feelings -- the way we feel when spring has sprung. Shiitakes grown on logs-- Best flavor and highest nutritional and health benefits. Get fresh shiitakes every 2 months for 3-4 years. Get two logs and get shiitakes every month! A log fruiting outside in spring will grow more mushrooms, bigger mushrooms, because it has its natural conditions. March is start of the spring “fruiting” season for the world’s second-most favorite mushrooms. They take their cue from warm days, cool nights, and plentiful rains. Lost Creek Mushroom Farm, where shiitakes have been growing on hardwood logs for over 25 years, boasts loads of shiitakes right now. Lost Creek Mushroom Farm has five kits under $50, starting at $18 for a 6” ‘Shroomie. Their most popular kit, a 9-10" log sells for $29.95. The Ma & Pa Kit – two 9-10” logs – is $49.95. The 14” logs with their own trays for soaking, fruiting, and resting are $45.95 and two for $80, a savings of $12. The newest kit, the Queen Anne, a 12" log in an attractive embossed-metal vase, sells for $48.00. Kits come with a ready-to-fruit log, directions, and recipes. Logs over 10” are guaranteed to produce. All prices include shipping and handling. The logs are oak or similar hardwoods, cut in winter when the sap is down. Williams drills holes, fills the holes with spawn (mushroom seed material) and seals them with wax. 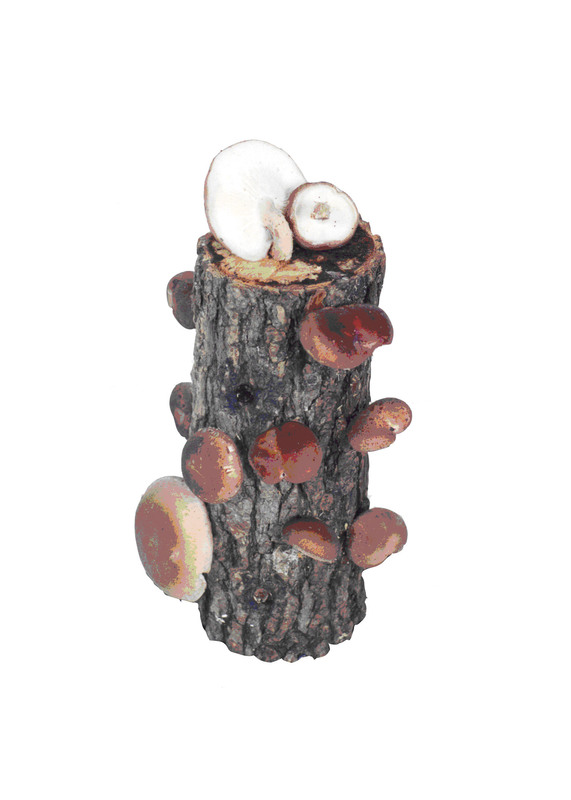 The shiitake spawn is left to grow inside the log for 8-12 months, with Williams watering them every week. Inside the log, the spawn sends out tendrils, called mycelia, that grow together, forming a colony. When the mycelia all connect, the log is ready to bloom with shiitakes. “Last spring’s logs are mature, going strong now,” Williams said. “It’s the perfect time to buy a kit and watch it grow. The mushrooms will be dark brown and meaty. They’ll grow every two months for 3-4 years or more. With two logs, you can harvest every month by alternating the fruiting log,” he added. The logs can live indoors like plants, outdoors in shade, or both. "Fruit it naturally outside in spring and fall, bring it inside summer and winter." Soaking the log in ice water or putting it in the refrigerator starts the fruiting cycle. The mushrooms will bud, appearing as “pins” within a few days, and harvest begins in 6-10 days. After harvest, the log will “rest” for two months, with regular soaking in nonchlorinated water, as it builds up more mycelia for the next fruiting. 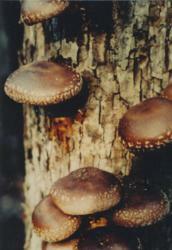 A shiitake log will produce increasingly larger yields as it matures. After a couple of years, production peaks, then tapers off. To order online, go to http://www.shiitakemushroomlog.com; call 800-792-0053, or mail the order to Lost Creek Mushroom Farm, PO Box 520, Perkins, OK 74059. Kits are also available at Amazon.com at slightly higher prices.